Digital interconnect is also completely configurable, and controlled by a swappable motherboard. Burl Audio offers four digital motherboards, the BMB1 (Digi-link), BMB2 (MADI), BMB3 (Dante), and BMB4 (SoundGrid). The BMB1 comes standard with two DigiLink connectors for direct hookup to Pro Tools. The BMB2 features two optical MADI ports for use with ASIO or CORE AUDIO PCIe MADI cards. 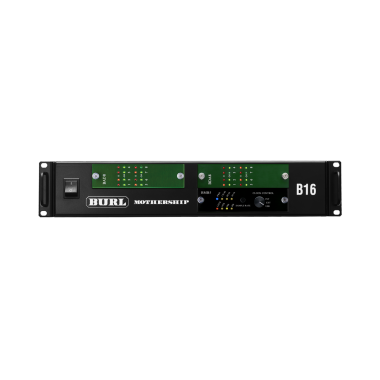 The BMB3 features two Ethernet ports for use with DANTE enabled DAWs and any DANTE enabled device, such as a digital mixing console. The BMB4 card allows for connectivity to any SOUNDGRID device, as well as low latency for a complete digital audio networking solution. The B16 Mothership is the result of over 20 years of tireless research and development. The no compromise, no BS design strategy is immediately apparent in the build quality. There are also plans for film and broadcast grade cards where channel density and price per channel are of greater concern. The B80 MOTHERSHIP takes care of virtually any music, broadcast or film recording situation, revolutionizing pro audio as we know it. In this digital era, many yearn for the tone of records past, and analog tape is becoming a lost art. The B16 MOTHERSHIP clearly bridges this analog to digital gap.